While October is our busiest time of year, incoming new business doesn’t slow down the exciting work we do for our clients. 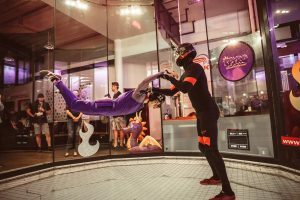 Our Technology team recently hosted a ‘Fly Like Spyro’ indoor skydiving experience at Bottrop for press and creators across ten markets. They arrived to see our Spyro branded car outside, a BBQ and cocktail bar and playlist from Spyro’s birth year 1998. They then experienced the thrill of indoor skydiving in specially designed Spyro flight suits with Spyro vinyl branding on the wind tunnel and B Roll gameplay playing on screens around the venue. Our press and creators loved every minute too, “What an amazing and unexpected evening,” Sam Loveridge, Games Radar. Our Energy+Industrials team kept regular updates and insightful pieces on the four-day Labour Party Conference, that took place in Liverpool. You can read the key take-aways from Jeremy Corbyn’s closing speech here. This week we also had the founders of Beyond Talent come in for our weekly session, Technology Speculators. Ollie Thomas and Natasha Mensah-Benjamin, the Managing Directors gave an insightful presentation on the independent agency. They specialise in talent and influencer procurement on behalf of brands, agencies and events, for global and local activations. For the first time, in a very long time, we have been nominated as a finalist for The Holmes Report Global PR Agency of the Year, which will be announced at the Sabra Awards 2018. We are delighted to also be in the running for the Automotive Award, Crisis and Issues Management Award and Specialist Consultancy of the Year Award at the PRCA National Awards 2018. And while we’re on awards, we are also shortlisted for Large Consultancy of the Year for the PRWeek UK Awards. We’re excited to find out the results! Our CPG wrapped up their 2018 activities for the Women in Innovation campaign for Innovate UK. Building on its previous success, our team worked with micro-influencers to spread the inspiring stories of Women in Innovation.